Mirta Ines Trupp delivers a tale full of history, grit and resurrection in her latest novel, Destiny by Design. Malka is the matriarch of the Abramovitz family. It is 1900 in Odessa, Russia and the current challenge is to keep her overprivileged daughter Leah at bay during the family meeting. While planning Leah’s eighteenth birthday is important, there are greater concerns to address. Leah’s oldest brother Moishe has called a family meeting. There are tumultuous times ahead if one is a Jew living in Russia. Moishe took the liberty to extend an invitation to Aaron, the family accountant, as support to plead his dire case. Leah, on the other hand, is not having any of it. Malka hadn’t asked to be the head of the family but had no choice when her beloved husband passed five years earlier. Granted, he had left a solid legacy for his family thanks to the success of the Abramovitz Manufacturing Company. However, Mother Russia had other designs for its future destiny. The revizor has paid the family a visit; forcing Avram, Malka’s logical and studious son, to request an extension to maintain the required balance needed to qualify their business for certification. The increasing animosity toward wealthy Jews in Odessa is becoming more ominous with each passing month. Leah, on the other hand, wants nothing of this ridiculous drama. Soon it will be her eighteenth birthday and the most important matter to focus on is the grand display her family will orchestrate to make the occasion the envy of all her friends. What Leah doesn’t realize is while opulence and indulgence may be all she has ever known, the Abramovitz family will be faced with the decision of either fleeing their Mother Russia with their lives in tact or stay and lose everything. I applaud Mirta Ines Trupp for the depth she demonstrates in writing an historical account of the perils Jews faced in 1900 Russia immediately preceding the Russian Revolution. She touches upon the premise of the have’s and have not’s and the stark differences between both classes. There are several passages early on where she focuses on the distinct corruption a government can force on a class of people to be sure they never get ‘too successful.' It is the government that will have the final say at the end of the day. The dialogue is rich, and the character development is defined beautifully. The motivation and inspiration behind this story is bittersweet as Ms. Trupp shares her personal journey of setting pen to paper in organizing this quite engaging story: “…Throughout this process, I have been overwhelmed by the magnitude of what my ancestors achieved. Had they remained in Russia, they would have, of course, suffered through the Revolution and the tumultuous period thereafter…” It is always a joy to read a story that is blanketed with the history that surrounds the premise. It is a winning formula that immediately captures the desire of the reader to continue to turn the pages. Beautiful job Ms. Trupp! I look forward to reading your next book. 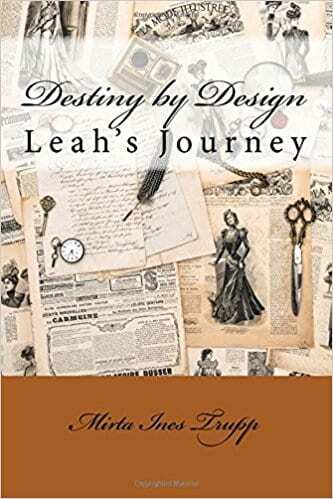 Quill Says: Destiny by Design is an epic journey that portrays the strength of family in the direst of times.